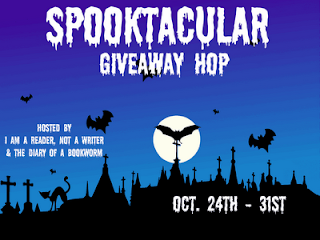 It is time for the biggest giveaway hop of the year: the Spooktacular Giveaway Hop. This hop, hosted by I Am A Reader, Not A Writer and The Diary of a Bookworm, begins now and will end on midnight, October 31st. 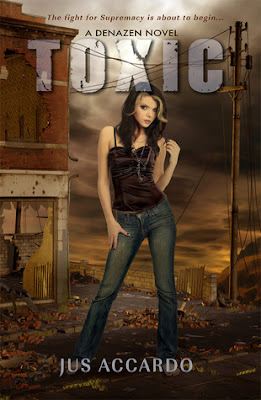 Reader Girls is giving away one e-book copy of Toxic (Denazen, Book #2) by Jus Accardo. We loved the first book in this series, Touch, and we're loving this one as well. We will gift one copy via Amazon (Kindle) or Barnes&Noble (Nook) to the winner. Our contest is open Internationally. When a Six saved Kale's life the night of Sumrun, she warned there would be consequences. A trade-off. Something taken for the life they gained. But Dez never imagined she'd lose the one thing she'd give anything to keep... And as if it's not enough Dez finds her immunity to Kale fading, the Six brought in to help Kale learn to control his killer touch starts drooling on him the moment they meet. Worse than that? Jade can touch Kale. But bimbo Barbie is the least of Dez's problems. Is it just me or is GFC not working anymore? Hmm........I'm not sure. Maybe Queen of the Damned? My favorite scary reads are any of Edgar Allen Poe's works :) Thanks for the giveaway! the machine gunners by robert westall. so creepy! It has to be Necroscope by Brian Lumley. I love his vampire stories!! Thanks! Some scary reads listed here! Thanks everyone for your scary books! I wouldn't say that it is a 'favorite' but the last really good scary book I read was "Before Cain Strikes". I don't really have a favorite but recently enjoyed Anna Dressed in Blood. Anna Dressed in Blood is pretty creepy! Gerald's Game by Stephen King. I must own Anna Dressed in Blood! I keep seeing this book everywhere on this hop! Thanks so much for being a part of this amazing hop and for the great giveaway. I really don't read horror but love paranormal so I don't really have a scary book fav but it is hard to pick just one favorite anyway. Thanks for the giveaway! I'm not great with scary reads, but I Stephen King books have always creeped me out!